[Nog niet beschikbaar in het Nederlands] On Monday Nov 6th, Prime Minister of Fiji Frank Bainimarama opened the COP23, stressing on the emergency of the situation “All over the world, vast numbers of people are suffering – bewildered by the forces ranged against them. Our job as leaders is to respond to that suffering with all means available to us“. All means? This remains to be seen. 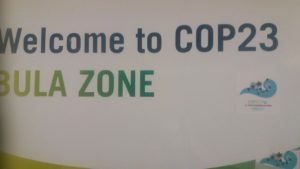 During all those polite formalities, we decided to attend to workshops at the People’s Climate Summit. 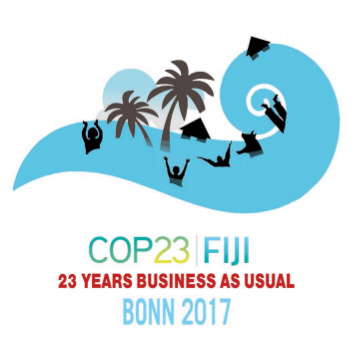 The PCS is a ‘place for networking and exchange’, where to discuss many interesting topics left out of the COP23 talks. 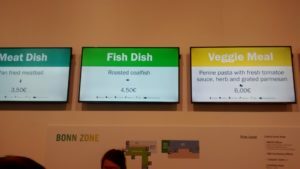 Indeed, this is where we met a member of the BUNDjugend, the Young Friends of the Earth Germany, who took a very nice picture of the cafeteria menu in one of the areas of the COP23. 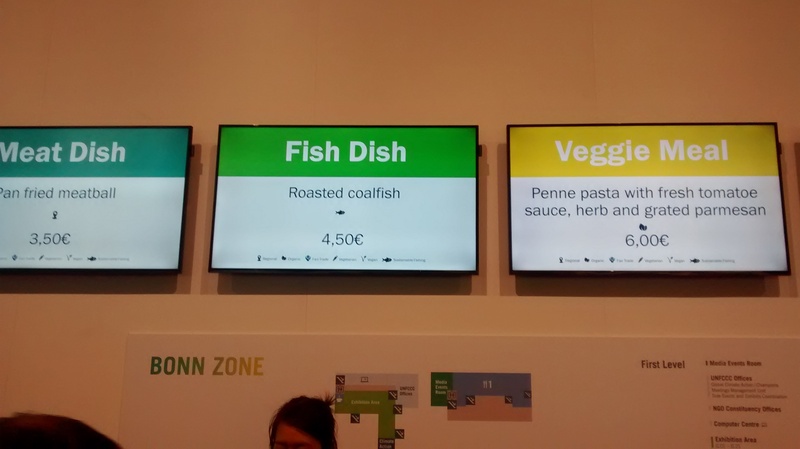 It is interesting to compare the price of the ‘veggie’ meal to the meat dish or the green ‘coalfish’ (what an amazing pun, we would not have made a better joke!). One will also note that pasta comes with a fresh tomato sauce in November. Offering a vegan option and an actual local, vegetable dish seems to be out of question. These details show the gap between the intentions and the concrete actions. 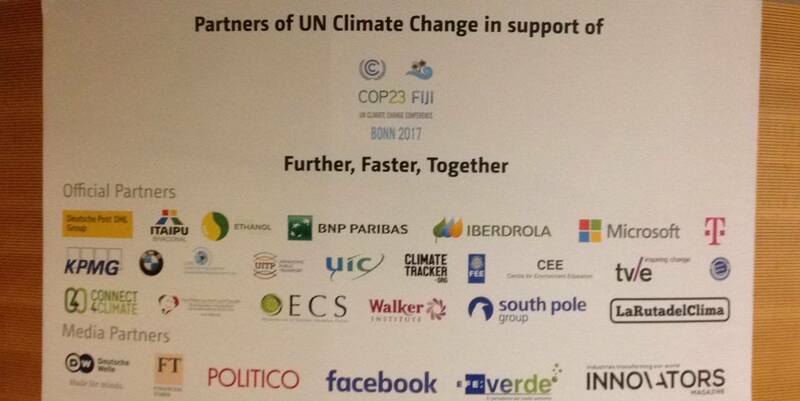 What else to expect if you take a close look at the sponsors? Let’s go back to the PCS! 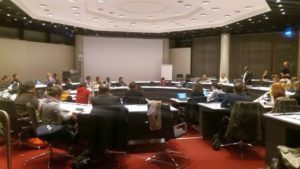 During the ‘Reclaiming our Rights to Food, Land and Water Workshop’, speakers from Indonesia, Pakistan, Paraguay and Togo explained the issues related to false solutions to climate change, usually implemented by governments advised by various lobbies. GMO’s are the perfect example, they are promoted and pushed in various African countries, leaving little or no choice to local farmers who see their land polluted or taken by huge corporations. Another interesting workshop was about geoengineering. You maybe know about some of those ‘science-based’, dangerous measures that have more to do with megalomania than realism to counter climate change. They can be ocean-based (fertilising the water to stimulate the algae growth), air-based (Solar Radiation Management with small particles in the atmosphere to reflect sunlight) or land-based (by created large white surfaces). There is a lot of criticism on those plans. The scale is too large, there are transboundary effects, they disrupt poorly understood ecosystems, there can be unexpected impacts and risks, and it is hard to stop a process once you started it. A major problem is that they exacerbate power balance; the people deciding or profiting are often not the people suffering from the side effects of geoengineering. This is even more dangerous when it becomes a commercial activity. However, we are not against innovation and technical solutions to reduce emissions. It is also clear that we need carbon sequestration to go back to a livable level of CO2 in the air. For this reason, the discussion in the workshop was about what could be good ‘geoengineering’ and what we should oppose. Or under which conditions could those measures be acceptable. The main conclusions were that the people affected should be involved in the decision-making, the project should serve general interest and not be carried out by large companies to make more profit. In addition, those project should always be stoppable and reversible. We know that regenerative agriculture enables to store a lot of carbon. Whether it is considered as geoengineering or not is in the end not relevant. What about Daisy World…? This a computer simulation term used for a new plan to develop and grow GM crops that are brighter and reflect more sunlight. Large fields with white daisies… A bright future, isn’t it? Our friends from the Animal Climate Action facilitated the workshop ‘Stop animal production, save the environment’. 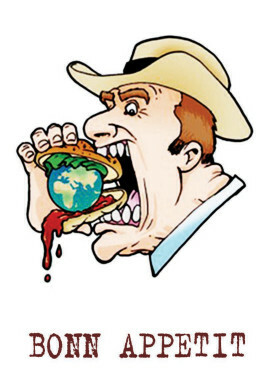 The first part consisted of an overview of the consequences of industrial animal agriculture and meat and dairy consumption: loss of biodiversity, pollution of land and water, deforestation, and, of course, climate change. The latter does not only happen because of green house gases emissions. It is also because healthy soils and forest, which are natural carbon sinks, are destroyed by the expansion of monocultures to feed cattle, pigs and chickens. 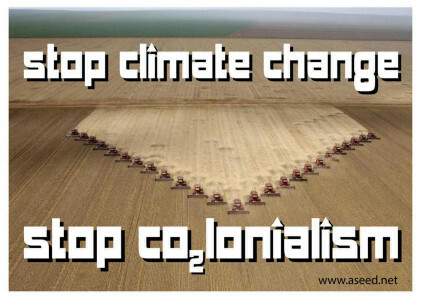 For more detailed information about climate change and (animal) agriculture, see the brochure ‘The climate crisis is a food system crisis’. Those are well-known facts to anyone who is familiar to the topic, but it cannot hurt to state it again and again. 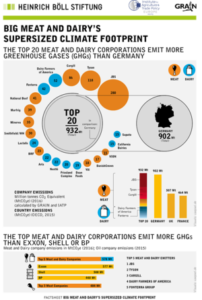 Indeed, the 20 largest corporations of this sector emit as much GHG than a country like Germany! And the top 5 corporations alone emit more GHG than a ‘champion’ like Exxon. Such a document is well needed to shed light on corporations which are never mentioned in discussions on climate. It also helps shifting the debate about animal products consumption away from a reductive, individual perspective. Eating a lot of cheap meat or dairy products in 2017 is not (only) about individual choices. If the ‘global middle class’ can afford the meat our grandparents did not often eat, it is because of the development of market structures facilitating mass consumption. And if we want to address this problem, we also need to challenge the corporations driving the growth of their sector. In smaller groups, the workshop participants discussed about the strategies and actions needed to implement changes. We agreed that we have to get more involved in the food production and distribution process instead of being satisfied with the status of ‘neoliberal zombie consumers’. As usual in this case, more questions came through the process. How to make the issue of meat and dairy production more present in society and within climate activism? At which level (local, national, international) is lobbying needed to counter and regulate the meat and dairy industry? After the workshop, the last preparations for the demonstration against the animal feed lobby DVT were arranged with AniCa and members of GRAIN. Together, we can reach a larger audience and make our voice stronger. 80% of the corporations from the meat and dairy industry sector are represented by the German pressure group DVT. They definitely understood that forming coalitions was a good strategy! More on this topic: watch an interview of Shefali Sharma (IATP) explaining in details the content of the infographic above-mentioned. 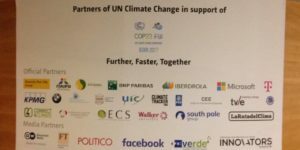 ASEED made a series of stickers especially for this climate summit, and those are very well received! Frequently we have to renew the piles at the several activists meetup spots and info points. 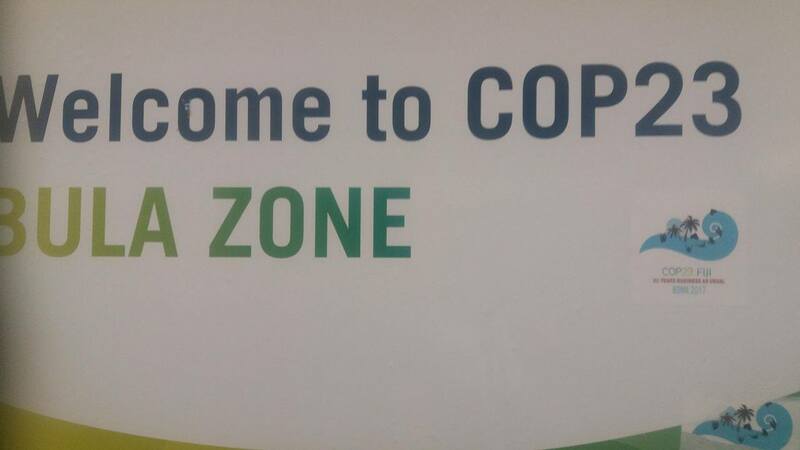 We made quite some COP23 observers laugh thanks to them. Somehow, it is still easier to reach people with a catchy picture than with a well thought-out background article.